What you're seeing here are actually two aspects of our galaxy that your naked eye can't perceive: its temperature, and its magnetic field. The colors show temperature, with dark red the hottest and dark blue the coldest. And the relief lines reveal the shape of the vast magnetic field that envelops our galaxy and protects us from some of the high energy particles zooming through deep space. 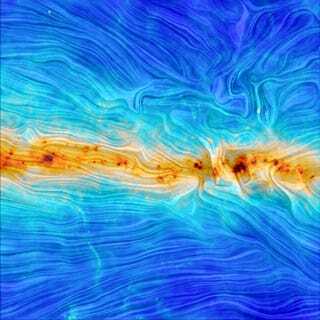 The European Space Agency reports that these images, captured by the Planck spacecraft, are among the first to reveal the shape of the Milky Way's magnetic field.